Home » Power Foods » Cinnamon Benefits – Do You Know What They Are? It is helpful from lowering “bad” HDL cholesterol levels to lowering blood sugar levels. This is for sure a valuable superfood to be included in our diet. At the bottom of this article, there are many recipes linked to. All of them are favourites of mine created in my kitchen. Did you know that it is made from the inner bark of a tree? There are two main types of cinnamon that are closely related. Cassia cinnamon comes from the Cinnamomum cassia tree which grows in southern China. It is the common variety we find in supermarkets that we all refer to as cinnamon. It is stronger and has a less delicate flavor and is of lower quality therefore less expensive. It is a dark brown-red colour. Ceylon cinnamon is known as real cinnamon. It is made from the Cinnamomum verum tree which is native of Sri Lanka and South India. Much of this cinnamon now comes from Indonesia. It is tan-brown in colour. It is a higher quality spice that is sweeter and it is more expensive which is why it is not as popular. What we know is that antioxidants protect our body from oxidative damage and cinnamon is full of antioxidants. In a study of 26 spices to find out which had the most antioxidants; it was cinnamon that had the most antioxidants even more than garlic and oregano. In another experiment, the extracts of black pepper, ginger, turmeric, and cinnamon, it was found that cinnamon had the highest antioxidant count. In a study with type 2 diabetes patients, cinnamon was found to reduce levels of ‘bad ’cholesterol and increase ‘good’ HDL cholesterol levels at College of Pharmacy, Pomona, California. 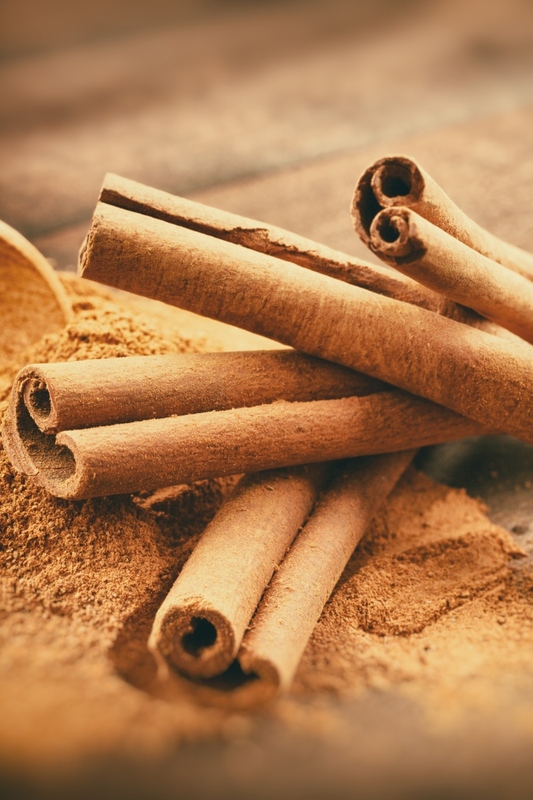 Ceylon cinnamon has two compounds that stop the buildup of tau, a protein in the brain that accelerates Alzheimer’s disease. Even though more research is needed, I think adding cinnamon sounds like a good idea. Cinnamon oil can treat respiratory tract infections caused by fungi according to studies. “It is concluded that these inhalable vapours appear to approach the ideal chemotherapy for respiratory tract mycoses.” ~ Centre for Biochemical Technology, Delhi, India. This spice has a reputation for helping to lower blood sugar levels. 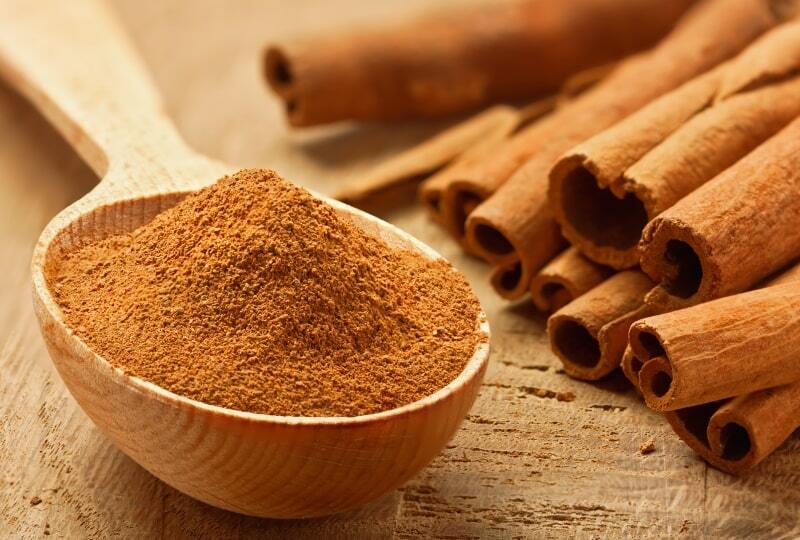 A number of studies have concluded that cinnamon lowers blood sugar levels in diabetics by 10–29%. That is impressive! There is a compound in cinnamon that mimics insulin which helps glucose acceptance by the cells. Also, there is a decrease in the amount of glucose that enters the bloodstream after a meal when Ceylon cinnamon is consumed as it slows the breakdown of carbohydrates in the digestive tract according to research. There is lots of research done on animals about cinnamon protecting against cancer and how it may fight the HIV virus. For me that does not convince me; human studies are still needed to confirm this. It does have naturally coumarin which is also found in peppermint, celery, honey, and carrots, which may cause liver damage in some sensitive people. The level of coumarins in Ceylon cinnamon is very small and the amount so small to cause health risks. The level of coumarins in cassia cinnamons appears to be higher and could cause a risk to some individuals if consumed in high amounts regularly. Cinnamon is a very good source of manganese and calcium and has many other vitamins and minerals. It is one of the first known spices. We get cinnamon from the bark of the cinnamon tree. 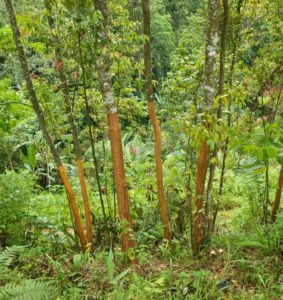 A cinnamon tree grows up to 60 feet; that is high! Another name for cinnamon sticks is ‘quills’. The fragrance was considered sacred and burned it at funerals by the Romans in ancient times. The Old Testament of the Bible mentions cinnamon many times. More than 10.5 million ounces of cinnamon are purchased by Americans each year. It works well with both sweet and salty dishes and drinks. Cinnamon is used in traditional medicine. Did you know that cinnamon is one of the flavours in ‘cola’ soft drinks? It is one of the oldest spices known. Egyptians used it 5,000 years ago as a flavouring in beverages and for medicinal purposes. They actually considered it being more precious than gold! Around 3,000 B.C., China started using it in a big way. By 2,700 B.C. it was mentioned in one of the earliest books on Chinese botanical medicine. In Medieval Europe, it was a spice highly relied upon. Cinnamon was one of the first commodity traded consistently between Europe and the Near East. Cinnamon comes in both stick or powder form. The sticks are best for longer storage but the powder is stronger in flavour. The best cinnamon has a sweet smell meaning it is fresh. Ceylon cinnamon and cassia Chinese cinnamon are labeled cinnamon. The Ceylon is sweeter and you may need to shop around for it since it is less available. Also, it is best to buy it organic to make sure it hasn’t been irradiated because it will lose some it’s health benefits when irradiated. Best to keep it in a tightly sealed glass container in a dry, cool, dark place. Cinnamon sticks will be fresh of up to one year and the ground version will keep for about six months. To make them last longer you can store them in the refrigerator. Check it’s freshness by smelling it. It should smell sweet. I use cinnamon often in making desserts in my kitchen especially crumbles, cookies and puddings. Below are a few and there are more to come as I am creating new recipes all of the time. Creamy Spicy Vegan Chai with lots of cinnamon. I love being able to drink creamy drinks that have no cows milk in them. This is a great tea on those cold winter days. 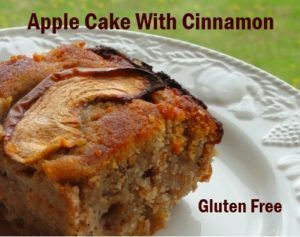 Healthy Apple Cake with Cinnamon – Gluten Free – This is a very tasty sugar free cake. It took me five times to get this recipe just right! All my happy taste testers liked it right away but I knew it could be even better and the recipe is better to. This is a deeply satisfying cake filled with healthy ingredients. Yummy Prune Jam is Sugar-Free with Apples and Cinnamon – This prune jam recipe is so easy to make and healthy without all that sugar usually found in jams. It took me just over an hour which included taking lots of photos of the jam too. Adding the cinnamon makes it extra delicious. I did add a little stevia to make it sweeter. Cinnamon Pear Apple Fruit Salad – This fruit salad is so delicious, especially in the winter. At that time of year, there are not so many fresh fruits in season. Apples and pears last a long time in the fridge. 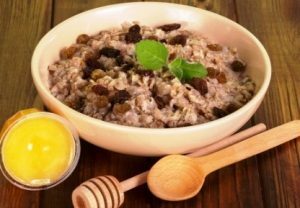 Oatmeal Cinnamon Porridge & Sultanas – This Oatmeal Cinnamon Porridge & Sultanas makes a great start to your day. I like the old fashioned oats as they have a fuller flavour and are healthier. You can eat this as a raw meal or make it into regular porridge. Deluxe Tasty Wild Rice Pudding – This wild rice pudding is a new favorite pudding of mine. It has a creamy consistency and it is still vegan which I like. It is not overly sweet and yet is a sweet pudding with lots of flavour and lots of wild rice which is full of health benefits. Learn more about some of the healthiest vegetarian foods you will always want to have in your pantry or growing on your deck.READ Superfoods – Over 100 of the Healthiest Foods You Should Have in Your Diet and learn more about the variety of Superfoods we think you should have in your diet.